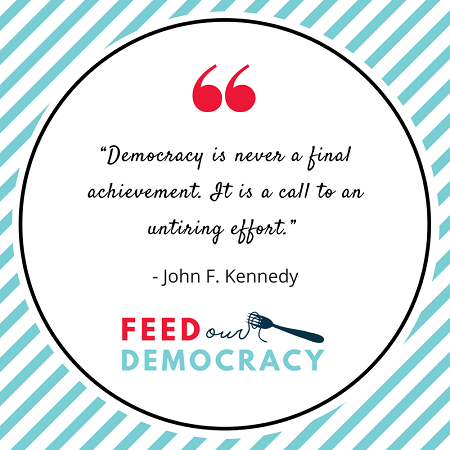 Your #FeedOurDemocracy event can build community, build awareness, advocate or fundraise for something that matters to you. A candidate, a cause, new playground equipment for your neighborhood…whatever mobilizes and energizes you to be involved. Meet, eat, activate. Like democracy itself, a #FeedOurDemocracy gathering is what you make of it. But here are some guidelines to get you started. 2. GET ACTIVE Pick a cause, issue or candidate you want to focus on during your gathering. 4. GET ORGANIZED Plan your gathering like you would any other party: pick a menu, plan a potluck, bake cupcakes, have postcards ready to be written…whatever it is you’ll need to make your event a success. 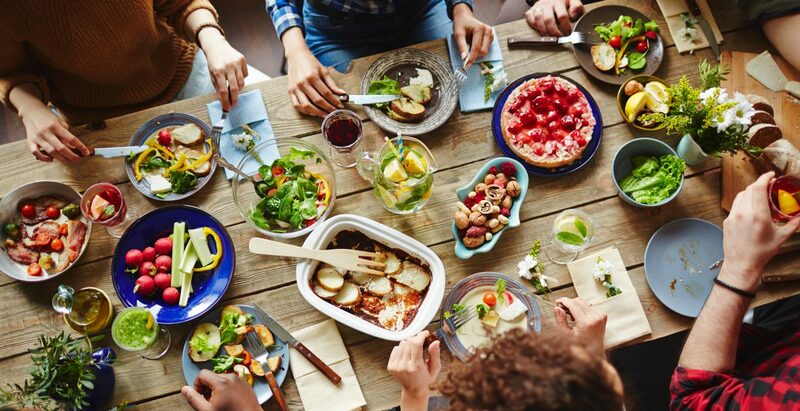 Check out our ToolKit for links to downloadable, customizable post card templates, recipe and menu ideas from The Mom 100, even sample invitation language for your new friends. 5 GET SOME INFO OUT. Send your #FeedOurDemocracy guests some information before they arrive so they know what to expect. Hosting your event to fundraise for a candidate? Send your guests a link to her website? Is your event about a advocating for a particular group? Find some great articles that got you interested and share those. You get the idea! Guests should know ahead of time if you’ll be raising funds, writing letters, or simply having meaningful discussions around a cause. 6. GET YOUR GOALS SET- Your event can raise cash, raise awareness, give people a chance to write some postcards…but it should do SOMETHING. Choose a goal, tell people what it is, and figure out how to get there. If you are raising funds, a good benchmark for how much to solicit from your guests could be to ask your guests to contribute what they would normally spend on a night out for dinner. For example, you could have a suggested minimum donation of $25 or $30, or even $5. Ultimately, you know your friend group and social circle and what would be acceptable and make sense. Check out our tool kit for many more resources to help your event be a success. 7. GET THE CONVERSATION STARTED Not sure what to talk about? The ToolKit has got everything you need to ensure you break the ice and keep the conversation flowing. We’ve also got information on how to find and contact your local representatives, techniques for talking about difficult issues and more. Check out our TOOL KIT and RESOURCE PAGE for everything you need to make your party a success. 8. GET ONLINE – What’s a movement these days without a Hashtag? Encourage your guests to share photos and more on social media using the #FeedOurDemocracy hashtag, so even people who can’t be with you and get in on the excitement. 9. GET ONLINE AGAIN – Once your event is over, we’ll ask you to fill out a survey so we know how it went. What worked, what didn’t? What did you accomplish? Evetually, the site will feature a running tally of the numbers: funds raised, letters written, conversations enjoyed and more so we can all see how our small events are having a big impact. 10. GET HAPPY – You’re part of a movement! Have fun. Our goals are serious, but you’re having a party. Enjoy making change happen while you #FeedOurDemocracy.